Minimally-invasive methods that truly tighten the face and body have long been the Holy Grail of cosmetic medicine. Until now. Dr. Julene Samuels shares the good news about two high-tech tighteners everyone will be buzzing about this year. It’s the one cosmetic benefit almost everyone wants that has remained hard to achieve without surgery: tightening. 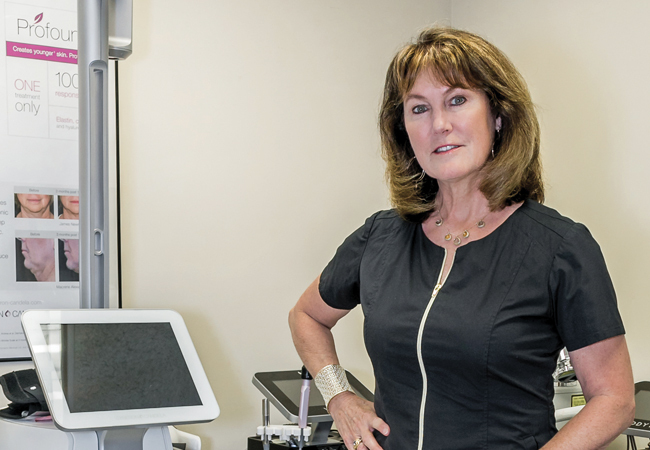 “We’ve been able to deliver some results with radiofrequency devices, but most results we’ve achieved haven’t been long-lasting and neck tightening has been the real bugaboo,” says Dr. Julene Samuels, a board-certified cosmetic surgeon in St. Matthews. Flash forward to 2019, when it appears that two new radiofrequency devices will become the go-to tools for firming face and body. “Profound, FaceTite and Renuvion came on the market a couple of years ago promising more dramatic, longer-lasting results and they’ve been even more of a homerun than anticipated,” says Dr. Samuels, who has been having great success using Profound on both male and female patients to tighten the neck and jowl areas. Both devices are inserted under the skin and use radiofrequency to heat and cool subdermal tissue in a flash— tightening in an instant. “You do make tiny incisions in the skin and insert the needles subdermally,” says Dr. Samuels. “It’s not completely non-invasive, but it’s out-patient and requires far less down-time than traditional surgery.” Unlike other non-surgical firmers, the dramatic results are achieved in one treatment. It may sound altruistic, but, as surgeons, we should be trying to help people avoid having so many surgeries. “I posted one result on a neck tightening and it went viral,” she says. “Necks have always been the single biggest reason to get a face lift, but with my Profound patients, I’ve been achieving two and three-year results and they haven’t needed to do any additional procedures,” she says. Dr. Julene Samuels’ office is located at 6400 Dutchman’s Parkway. Call (502) 897-9411 or go to awomanstouchmd.com for more information.